There's nothing quite as exciting as fluffy and warm homemade vanilla cupcakes. Try this one of a kind, sweet recipe that is perfect for any occasion. Adjust rack to lower third of oven; preheat the oven to 375°F. Place paper cupcake liners in a 12-cup muffin pan. Sift the flour, baking powder and salt onto a piece of waxed paper. Place the milk in a small bowl. Stir in the vanilla. Using an electric mixer, cream the butter until smooth, about 30 seconds. Add the sugar in a slow, steady stream beating until light and fluffy, about 3-4 minutes. Add the eggs, one at a time, mixing until the batter is light and creamy, and scraping down the sides of the mixing bowl after each addition. Add the dry ingredients alternating with the liquid ingredients in 4 additions, beginning and ending with the dry ingredients. Spoon the batter into the muffin cups, filling each about three-quarters full. 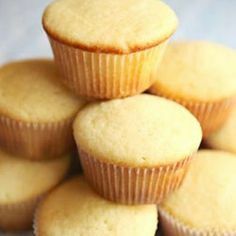 Bake for about 20-25 minutes, or until the top of the muffins springs back when lightly touched, and a wooden toothpick inserted in the cakes comes out free of uncooked batter. Let the cupcakes cool in the pan for 5-10 minutes before transferring them to wire racks to cool completely. 0 Response to "Basic Vanilla Cupcakes"